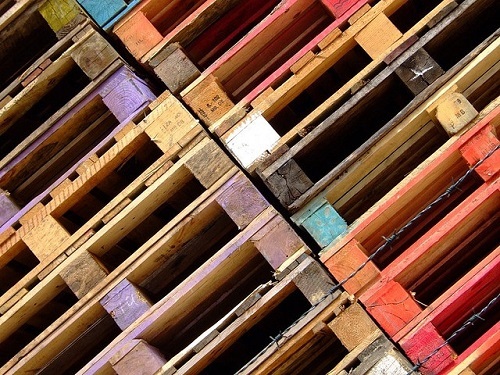 Pallets may appear to be simple structures that support loads but their design and manufacture is a sophisticated process. They provide a structural base for a load and protect it when it is in storage and during handling and transportation. Wood is the most common pallet material. Plastics – mostly high-density polyethylene (HDPE) and polyethylene teraphthalate (PET) — are thermoplastics that are resistant to weather and corrosion and used to make very durable pallets. Customers buying wooden pallets can choose from standard sizes in 100 per cent natural timber or engineered wood, or give precise specifications on materials and design that the manufacturer will follow. Once the vendor is clear about the specifications and delivery date, the process begins. The appropriate wood is selected and the pallet deck boards and stringers – the three or more parallel pieces of timber that cross them at right angles – are cut to size. The wood is usually softwood (coniferous), though engineered timber can be as hard and durable as some hardwoods. Notches may be cut in the stringers if four-way access to the pallet sides is required. Pure timber has to be treated under the ISPM15 international regulations to prevent the spread of pests and fungi. The wood must be heated to a minimum of 56 degrees Celsius over 30 minutes. The treatment kills pests and minimises the moisture content of the wood, making for lightweight pallets. Engineered wood is exempt from ISPM15 as pests would have been destroyed by heating and gluing during the manufacturing process. 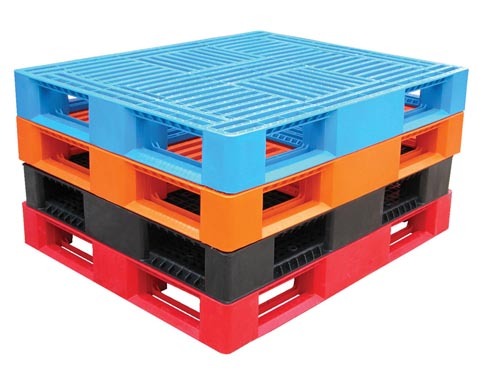 Customers order plastic pallets according to specifications as in the case of wood. However, in contrast to wood, there are a number of manufacturing processes for these pallets. The high-pressure injection-moulding process starts by melting the plastic – usually HDPE resin — material and colorant together in a container. The melt is injected into a mould that is clamped together under pressure. This is a costly but very fast process. Structural foam moulding is a low-pressure version of injection moulding. Polyethylene or polypropylene and nitrogen gas are injected into a mould cavity. Heat is applied to activate blowing agents and create foam with a solid skin. This process requires less material than the high-pressure injection moulding. Thermoforming is the most common plastic pallet manufacturing process. Polyethylene pellets are heated to create a nearly liquid plastic sheet. This is pulled into a mould and vacuum-formed. In the compression-moulding process, a two-piece mould is loaded with plastic using extruders, or even manually. Once filled, a press closes the two moulds. Pressure forces the plastic material into the mould cavities. Rotational moulding is a process that dates from the 1970s. Powdered plastic is loaded into a mould. This is then heated as it rotates in two planes perpendicular to each other. The rotation ensures distribution and fusion of the plastic. Profile extruded pallets look like wood pallets and are constructed in a similar way. Plastic is melted, forced through an extruder, then cooled and cut to size. The separate pieces are joined using screws, nails, glue or heat welding.